Eliminate constant tending to the fire or overcooking your food. Maintaining grill temperatures, even in the best of conditions, can be difficult. With outdoor grilling comes the inevitable battling of the elements, which can keep food from cooking at the proper temperatures. Every chef and pit master knows that control and consistency are two of the biggest virtues in the cooking world. Even a windy day can affect the cooking properties of a poorly manufactured grill. Temperature control is important in ensuring what you cooked actually ends up being just that, cooked, because compounds in foods react differently at different temperatures. Meathead Goldwyn (BBQ guru at amazingribs.com) explains: “For example, meats are composed of protein, water, fat, collagen, and some sugars. Fats render at one temp, water evaporates at another, collagens melt at another, sugar caramelizes at another…” and the list goes on. When your grill temperature fluctuates without control, you run the risk of drying out your foods, needlessly lengthening your cooking time, or over-cranking to recover. Proper temperature control can be the difference between a juicy, delicious burger and something more along the lines of a hockey puck. Goldwyn further relates, “The single most essential concept an outdoor cook needs to understand is the importance of temperature control and how to use a 2-zone setup.” We totally agree, but thanks to Memphis Wood Fire Grills’ convection capability, a 2-zone system isn’t necessary on our grills. Plus, our engineers have designed our grills with precise temperature control in mind. You won’t find another grill on the market that can hit and hold temps like a Memphis. 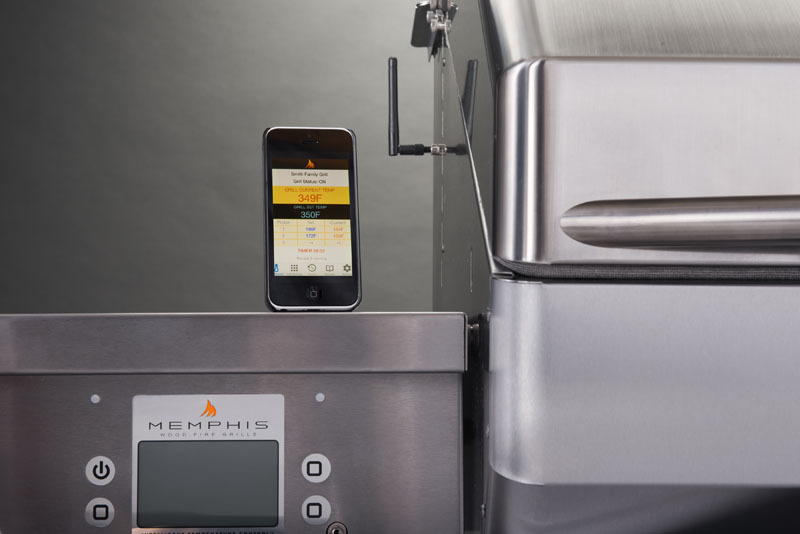 And by setting your desired temperature using the digital ITC (Intelligent Temperature Control) and inserting the programmable meat probe, your food cooks until it’s done and then the grill turns the heat down to “warm,” keeping your chow hot and ready-to-eat when you are. 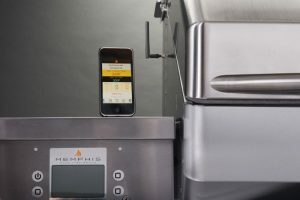 And with our new Wi-Fi enabled controller and free iOS app, you can now control and monitor your grill from anywhere you have a cell phone connection. Many other grill/smoker apps work locally – meaning you have to be within range of your Wi-Fi at all times. Ours, however, allows you to check your grill from work, the store, or your car (the passenger seat of course). And as an added benefit, the App has numerous automated recipes that will cook your cut of meat to perfection. The Intelligent Temperature Control knows exactly the perfect cooking and internal temperatures and ensures your food will meet your high standards.